So many good things have been said of Wild Rocket at Mount Emily that it is amazing how long it has taken us to try it out. 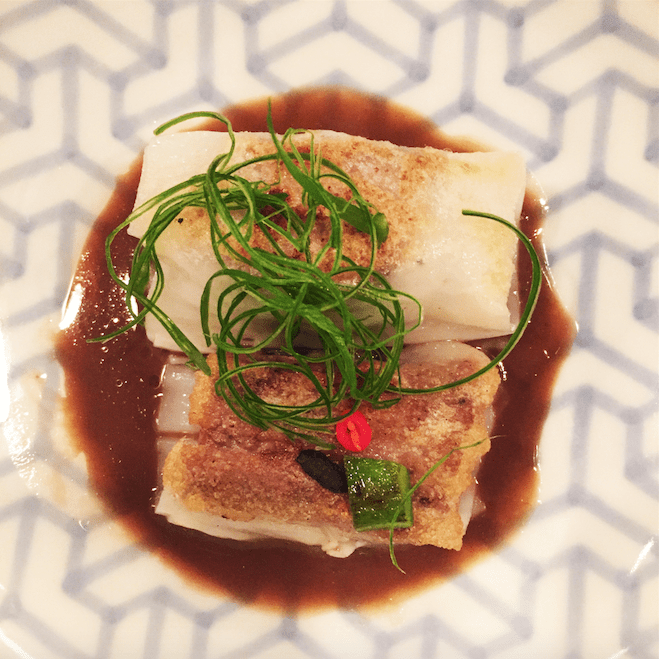 But better late than never, as we celebrated one of our birthdays with a meal at lawyer-turned-chef Willin Low’s flagship restaurant in March 2016. The restaurant is tucked away from the the hustle and bustle of the city in a tranquil area on Mount Emily Hill. Getting there is a bit of challenge without driving or taking a cab. There are no buses that head up to the location and it is a bit of an uphill climb from the nearest bus stop at the foot of the hill. Nevertheless, for those who are keen to hike up, the payoff is immense with the food at the restaurant. We chose to cab there for our visit. Wild Rocket serves what Chef Low terms as “Mod Sin” or modern Singaporean cuisine, which is a combination of the flavours of Singaporean food with Western ingredients. Essentially, it is fusion food. We had the well-recommended omakase menu that evening and were seated at the restaurant’s counter area for it. The omakase menu consists of 10 courses of chef selected dishes. That evening, we had a line-up of wonderfully imaginative re-inventions of popular Singaporean food. “Bak Chor Mee” – The chef’s take on the the traditional hawker dish saw rice vermicelli topped with carviar and a sprinkling of crispy pork lard all around. We had to mix everything up for all the flavours present in the dish to combine before eating it. The dish tasted of the familiar with the flavour of bak chor mee, but yet provided something entirely new with the way the dish was made. A Thai-Inspired Pomelo Salad – In this cold starter, the chef managed to fuse the flavours of Thai green curry into a salad of pomelo, mint and other Asian vegetables. The dish was served with a scoop of ice-cream, which took us aback at he outset. It was the first time we had ever been served ice-cream in a starter. We were informed by the waitress to break the ice-cream and mix it up into the salad before eating it. Upon tasting this starter, we discovered the reason for the ice-cream in relation to the rest of dish. It was coconut ice-cream that, when mixed, merged with the other ingredients to collectively produce the flavours of Thai green curry. We were amazed by this highly unconventional dish that truly did its work as a starter to awaken our tastebuds. 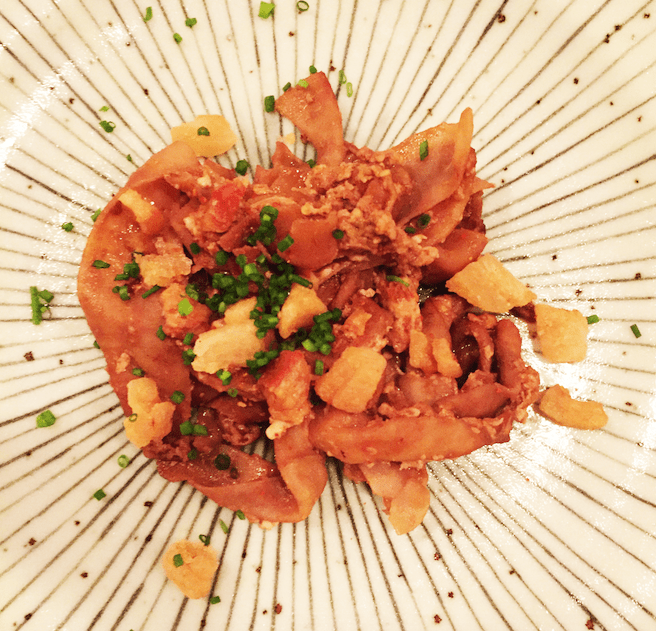 “Char Kway Teow” – Our first main was introduced to us by the waiter as “char kway teow”. He went on invite us to taste it and guess what ingredient was used to make the “kway teow” (flat rice noodles) that is the main make-up of the popular hawker dish that inspired this main. The dish had a comforting taste of char kway teow and the “kway teow” was springy and firm, which led us to guess that it was probably made of pork skin. We were surprised when the waiter revealed that there was no meat or carbs in the dish. The “kway teow” was, in fact, made of cuttlefish! Wow! 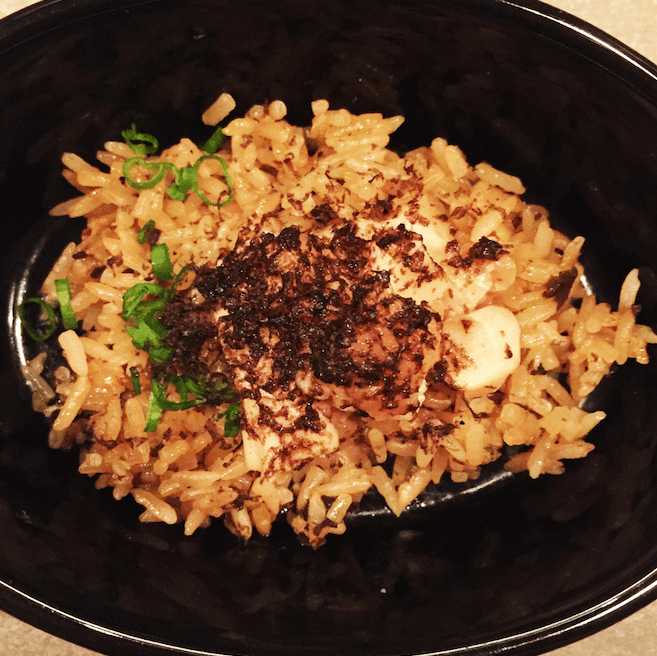 Black Truffle Chicken Rice – This interpretation of one Singapore’s iconic hawker fare had flavourful rice and little chunks of chicken to boot. The real highlights of the this main, however, was the generous use of black truffle shavings that complemented the dish so well. Taken holistically, the dish had the fragrance of lup cheong (Chinese waxed sausages), even though there was none in it. “Har Cheong Kai” (Deep-fried prawn-paste coated chicken) – When this dish was served, the waiter once again invited us to guess what was the ingredient that constituted the dish. No chicken was used, but the dish had the distinct flavour of the zi char dish so loved by Singaporeans, nevertheless. The deep-fried strips had a chewy texture with an accompanying flavour that we thought had to be some kind of seafood, such as squid or anchovies. We were wrong. 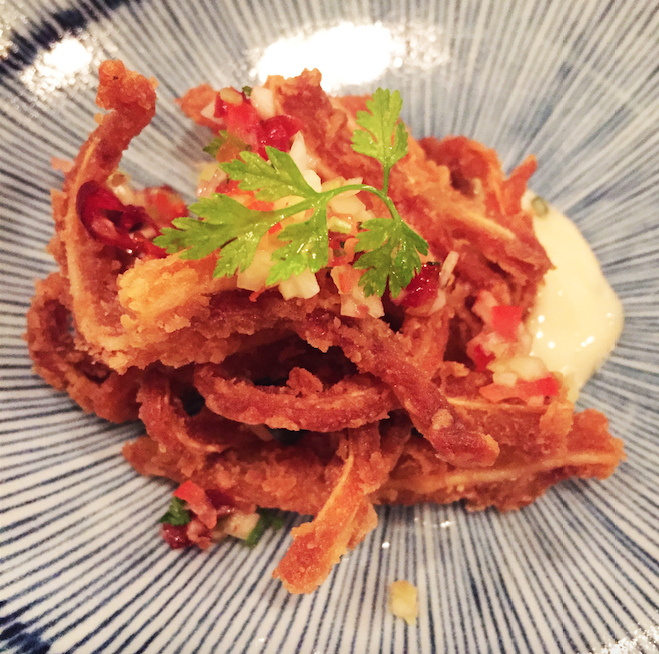 The chief ingredient of this dish were pigs’ ears. We were pleasantly amused. “Singapore Fried Noodles” – Now, having travelled around and lived in London for a bit, we have always known that there is no such thing as Singapore noodles. With this fact in mind, we saw how the chef demonstrated good humour in his creation of this dish. Introducing this dish, the waitress highlighted that the chef knew full well of the non-existence of Singapore noodles. 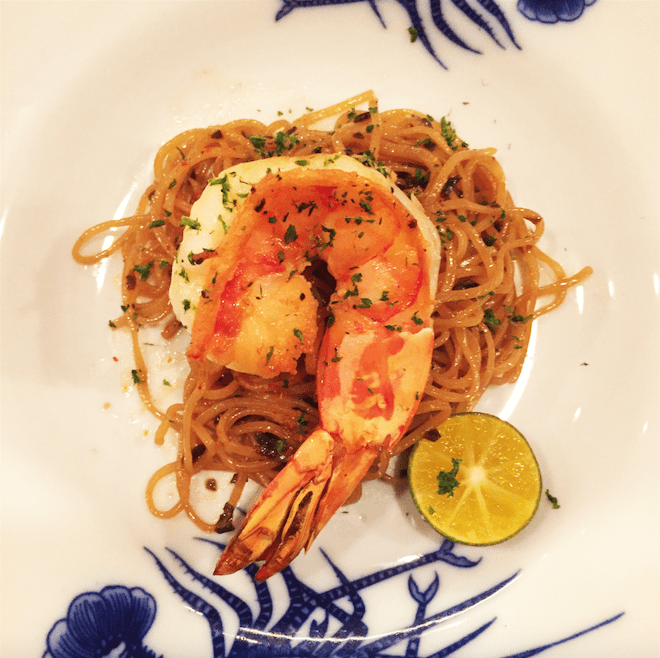 Therefore, in jest, he created this satirical dish of fried pasta topped with a prawn as a mockery of the West’s belief in the existence of its namesake. Brilliant! It tasted lovely in any case, much better than its namesake, which we had the displeasure of trying over in London. “Si Chap Hor Fun” – This re-imagination of the classic Cantonese dish was made up of a chunk of beef short-rib cooked for 48 hours wrapped in a layer of cheong fun (flat rice noodle). It was an interesting take on the traditional dish with the beef flavourful and tender. However, this final main paled in comparison to all the other dishes that evening. Somehow it tasted one-dimensional and lacking a complementary flavour to make it more complex. We could not quite pinpoint what was this flavour that was lacking though. Perhaps a dash of “wok hei” might have helped. Guava Sorbet topped with dried tangerine peel – This dish provided the perfect transition into dessert, after all the intense flavours we had with our mains. 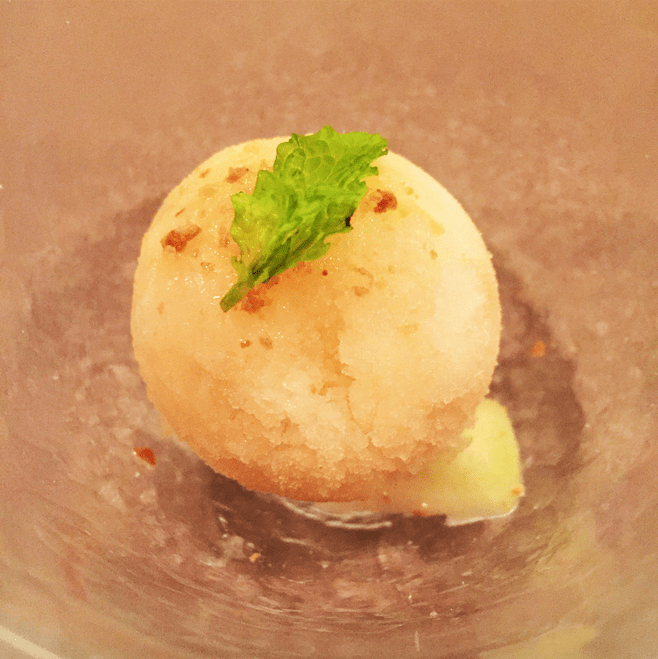 The sorbet was light, refreshing and served well with fresh guava. 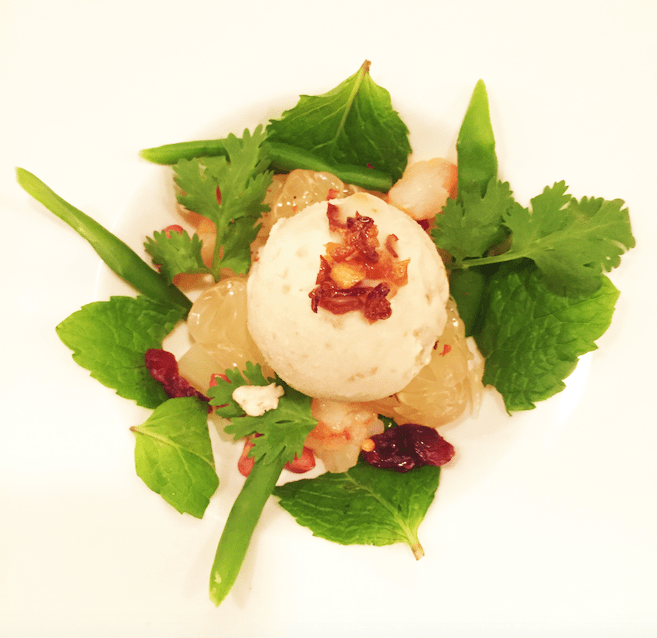 Chendol Ice-Cream – With our palates cleansed and refreshed by the guava sorbet, we moved into dessert proper with this intensely yummy take on chendol. 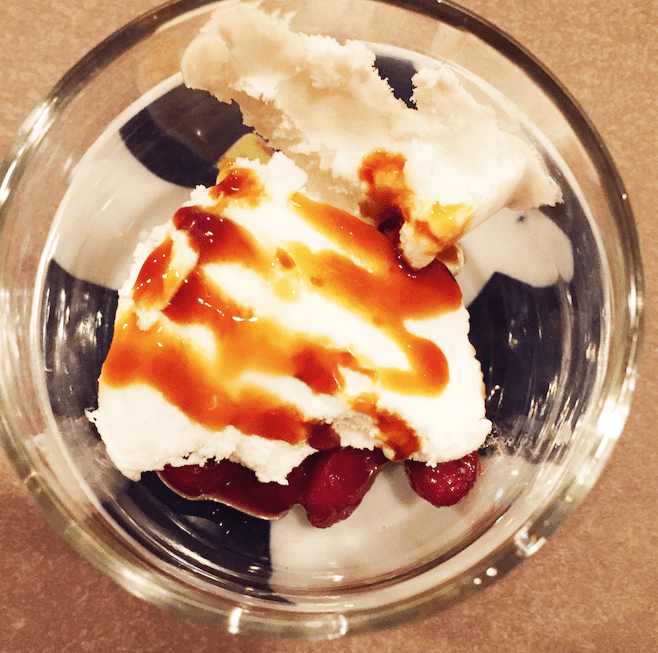 It consisted of coconut ice-cream, red beans, gula melaka and chunks of digestive biscuits. It capped a good meal. 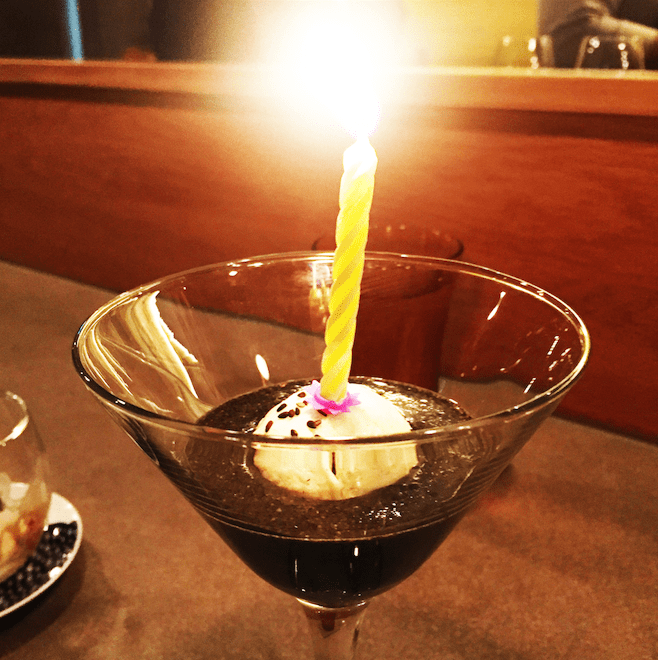 Special ice-cream in black sesame – Of course, it being a celebratory birthday meal, the restaurant were kind enough to prepare a complimentary dessert of ice-cream drowned in black sesame paste. The ice-cream went well with the black sesame, and it left us all contented to say the least. Overall, we were blown away by the creativity that went into conjuring the unique imaginative dishes that was served to us. 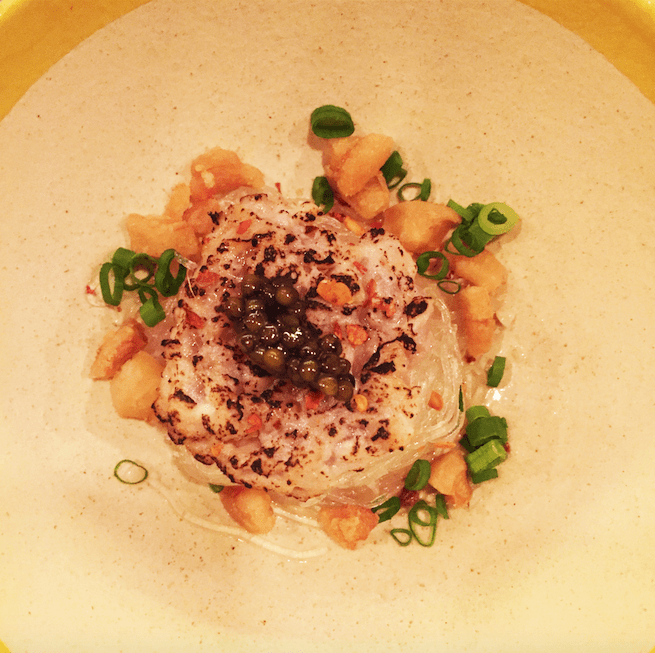 It truly demonstrated Chef Willin’s ability to push certain boundaries by re-inventing foods that are familiar to the Singaporean palate with some truly out-of-the-box thinking. We are thoroughly impressed. If the Michelin inspectors have any sense in them at all, Wild Rocket at Mount Emily deserves, at the very least, 1 Michelin-star.